Our Gold edition offers both model management and version control. Please visit our pricing page below or more details and to contact an IBM Sales Representative. How can I try out SPSS Modeler? Sign-up for the product tour below and find out how to take advantage of open source innovation including R or Python. Start building a machine learning model today! What demos do you have available for SPSS Modeler that I can see various features? We have many demos available around accessing, manipulating, and analyzing your data. Please reference our demos page to get started. What are the software requirements for SPSS Modeler? System requirements can be found below. 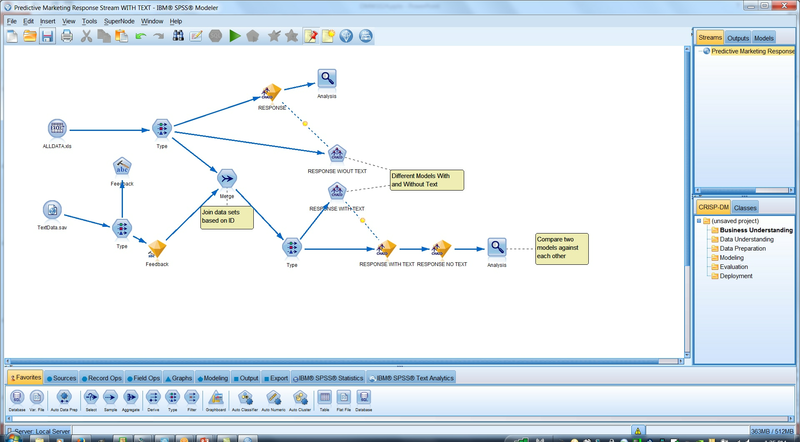 For Modeler Premium and Text Analytics, SPSS Modeler client must already be installed. What is the latest release for SPSS Modeler? SPSS Modeler 18.2 is the latest release. It focuses on modernizing the user interface, embracing and extending open source capabilities, and bringing analytics to the data. What editions of Modeler are available? We offer three SPSS Modeler editions including Professional, Premium, and Gold. To see a comparison of the options, please visit our pricing page below. What does SPSS Modeler Professional include? SPSS Modeler Professional includes an extensive range of data preparation, graphical and data import and export functionality as well as the full range of Modeler’s classification, association, segmentation algorithms with Automated modeling procedures. For more information, see below. What does SPSS Modeler Premium include? SPSS Modeler Premium extends the functionality of SPSS Modeler Professional by providing additional Text Analytics capabilities for the analysis of unstructured data sources such as customer comments, blogs, RSS feeds, and documents in multiple text formats. For more information, click below. What does SPSS Modeler Gold include? SPSS Modeler Gold extends the functionality of SPSS Modeler Premium to provide a complete server-based predictive analytics modeling and deployment platform. SPSS Modeler Gold includes the SPSS Collaboration & Deployment Services platform to enable sharing and governance of key analytical assets. What are the licensing options for SPSS Modeler? There are a variety of licensing options available for SPSS Modeler. SPSS Modeler Professional and Premium can be licensed by Authorized User and Concurrent User in both Term and Perpetual license models. These editions have server options available priced in Processor Value Unit. Where can I find your pricing options? For pricing, please visit below to view our various options and to contact an IBM Sales Representative. How do I get support for SPSS Modeler? Please use the SPSS support site by following the link below. You can download the software, open and monitor support tickets, find an authorized IBM partner seller and more.